Monrovia, Liberia: His Excellency President George Manneh Weah Monday, April 8, reached out to dozens of fire victims in the densely populated Popo Beach community on the Bushrod Island, not only supplying them food and personal effects but also promising to build them shelters in 60 days. At least 15 houses, most of them zinc sharks, were on Thursday, April 4, devastated by a sudden blaze of fire. Scores of residents were left homeless. The Liberian leader moved into the community, which is adjacent to the headquarters of the Liberian Coast Guard edging on the Atlantic Ocean, and trekked the charred debris of the victims’ properties to take a firsthand appreciation of the situation. Swarmed by throngs of Popo Beach residents and other curious neighbors, President Weah consoled the victims and promised that his government would rebuild their homes in two months or so. He assured the victims that include women, youth, children and the elderly of his administration’s commitment to providing them appropriate and timely assistance. Amidst thunderous cheers, the President also announced that homes within the affected areas will also be remodeled to meet minimal standards of decent home for the victims. President Weah appealed to youths of the community to assist the team in carrying out the construction work, and to also provide security for the building materials that would be taken to the project site. He promised to keep visiting the area until the project is completed. During the visit, President Weah presented 300 mattresses, 100 bags of 50kg rice and 15 bales of used clothes to the victims. Following the visit to Popo Beach, the Liberian leader briefly stopped at the Coastal Defense Project site in New Kru Town where he was briefed by the team in charge on progress. 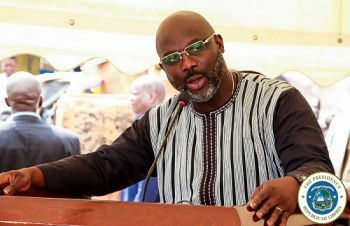 From New Kru Town, President Weah drove through Logan Town, Gardnersville, Pipe Line and Johnsonville communities to ascertain progress of ongoing road projects.